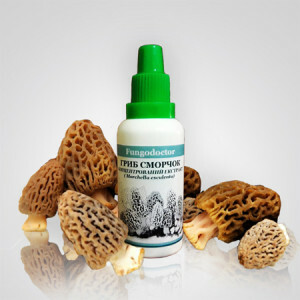 Extract of fungus coprinus (Coprinus comatus), a propylene glycol auxiliary. Homogeneous transparent liquid of brown color. It is allowed to form a small amount of sludge at the bottom of the vial. The composition of the extract: polysaccharides, tetraethylthiuram disulfide, phytoncides, many essential amino acids, lipids, mostly represented by unsaturated fatty acids, flavonoids, antioxidants, vitamins B, C, mineral components and microelements. Strengthens immunity, increases the nonspecific immunological reaction of the organism, which allows successfully using the drug to preserve the health of the elderly. It has an antitumor effect (increases the number of T-lymphocytes to 35,38%, strengthens the antitumor immunity, prevents the growth of tumors due to the enzyme polyose), proved the effectiveness of corinus in the treatment of adenoma, cancer of the prostate and breast. Helps in the treatment of chronic alcoholism and domestic drunkenness. It prevents the development of atherosclerosis, cardiopathy, considering that the lipids contained in the fungus are mostly represented by unsaturated fatty acids, including linoleic acid. 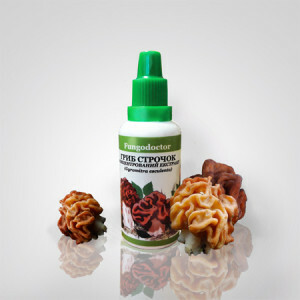 Promotes better digestion, stimulates appetite, is used in the treatment of constipation and hemorrhoids. 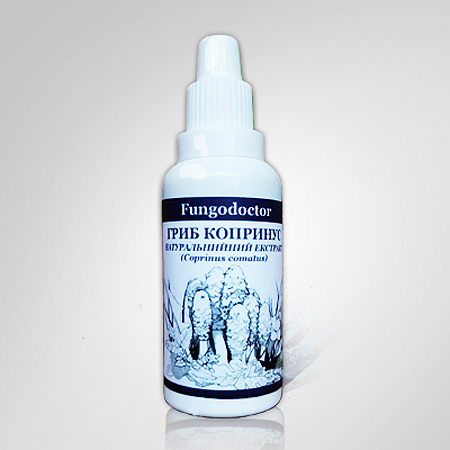 Regulates the concentration of glucose in the blood, the use of fungus coprinus as a health product and a medicine for the prevention and treatment of diabetes has great prospects. The ability to synthesize antibiotics of bactericidal and fungicidal action, effective against the causative agent of gas gangrene, staphylococcus, some types of mold was revealed. Japanese studies have proved the effectiveness of the co-prone in the treatment of joint diseases. Dosing and Administration: take 5 - 10 drops under the tongue for 20 - 30 min before meals 2 - 3 times a day. The daily dose, the frequency of application and the duration of the course is determined by the doctor. Storage conditions: Store in a dry place protected from light and out of the reach of children at temperatures from 0 to 25C. Shelf life is 2 years. Do not use the product after the expiry date printed on the package.